The FCA regulate the financial services industry in the UK. Their aim is to protect consumers, ensure the industry remains stable and promote healthy competition between financial services providers. 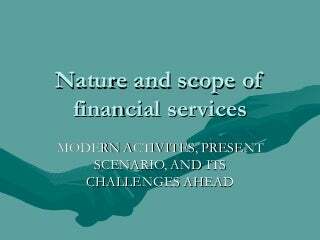 The FSA and IFSA is the culmination of efforts to modernise the laws that govern the conduct and supervision of financial institutions in Malaysia to ensure that these laws continue to be relevant and effective to maintain financial stability, support inclusive growth in the financial system and the economy, as well as to provide adequate protection for consumers. With the reality of increasing, devastating business interruptions due to hurricanes and other natural disasters, terrorist threats, regional infrastructure failures, and breaches in technology security, this initiative is re-defining what it takes for the financial services industry to stay in business, no matter what the circumstances. The Financial Services office is an active partner in fulfilling the University of West Florida’s mission of instruction, research and public service, by planning, developing and providing professional accounting services and related financial support to administration, students, faculty and staff.